Joanne Nolan & Aiden Allen decided on a Winter Wedding with colourful peacock feathers as their theme. With the Winter sun shining brightly on their special day the couple from Spondon could not have chosen a better time of year to say I do. 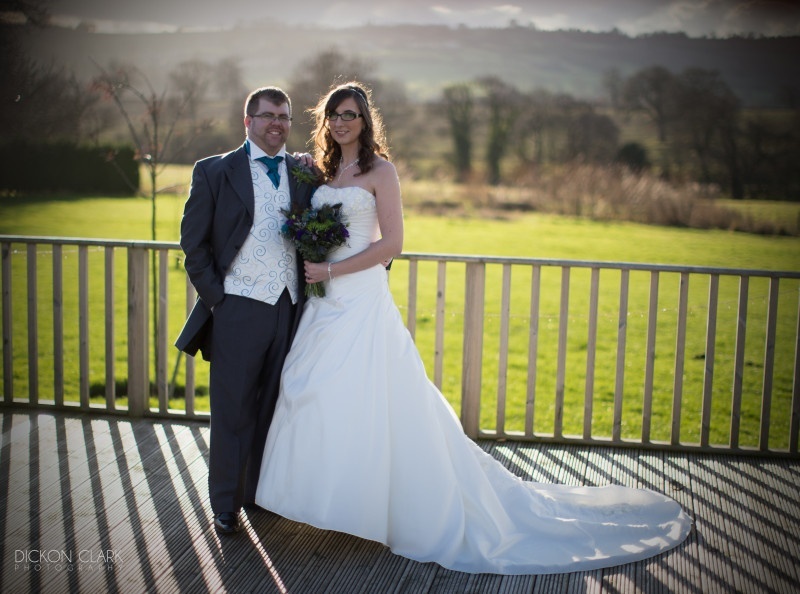 Joanne & Aiden talk us through the highlights from their Wedding on the 19th January 2014. Where & when did you first meet? We used to work for a nursery chain, and we would take children swimming to Moorways on a Friday morning. So we actually met in a family changing room! We met in October 2007, and although we were friends for a long time first, we both knew that there was something special there. It was at home on Christmas Eve 2012, and we were joking around about getting married. Jo asked if Aiden was to propose, would he know what to say. He got down on one knee and gave her a card which said “To my Fiancee”. When Jo looked up he was holding the ring. Aiden obviously had it all planned and although he may not have known exactly what to say he knew how to show Joanne that he wanted her to be his wife. 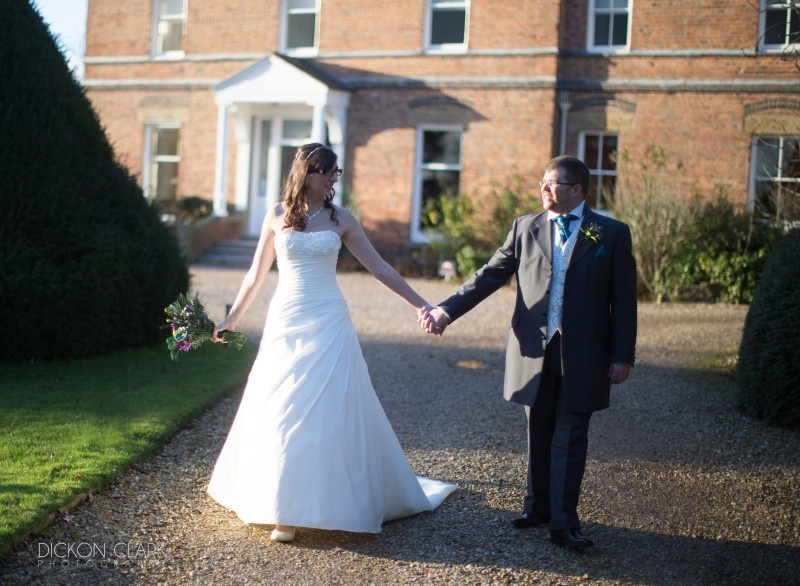 Why was Shottle Hall the perfect venue for your big day? It was the first and only venue we looked at, about 3 weeks after the proposal. We had already decided that our theme would be based on peacock feathers, and as soon as we entered Shottle Hall, there was a vase of peacock feathers on reception. We knew it was a sign! We could not fault Shottle Hall, the bedrooms were stunning and Jo instantly fell in love with the chandelier in the Orangery restaurant. We could both instantly picture our wedding being here. Bestman, Bridesmaids & Ushers: Our best man was Matt, the man who had raised Aiden as a child and had been like a father and big brother to us both. He arranged the wedding cars for us, and could not have been more supportive. The ceremony: It was a small civil ceremony held in the Lounge at Shottle Hall for about 40 guests – close friends and family. We had readings by Danni (Aiden's Sister) and our friend Faye. 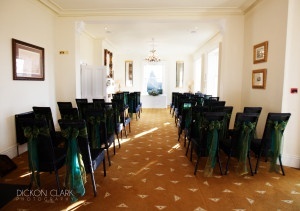 We had the best weather on the day, with beautiful blue sky and bright sunshine streaming through the large picture windows. 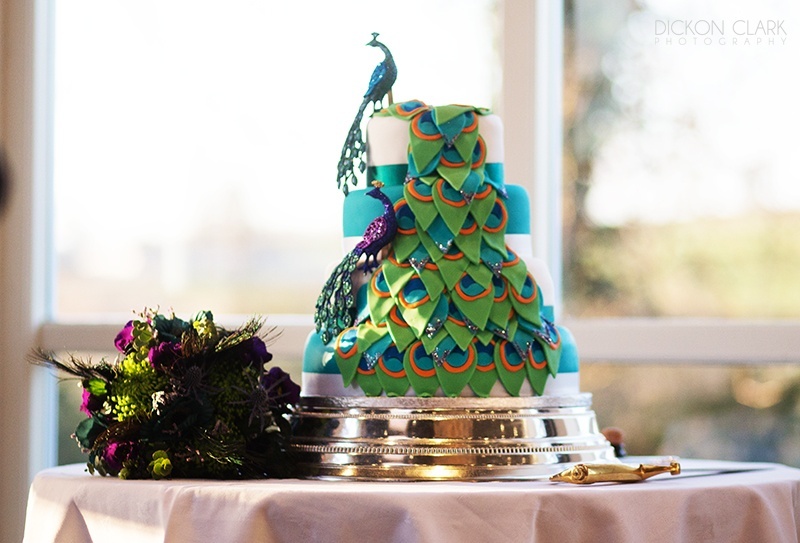 The theme: Our theme was peacock feathers, which we had come across just by chance whilst looking at cake designs. We both loved the colours in the feathers, and it allowed us to be quite creative with the colours. We had teal bridesmaids dresses, gold and green chair sashes and table runners, and teal and purple accessories such as favours and kids gift bags. It also enabled us to incorporate them in our flowers. Cake: The cake was made by Jo’s friend Sarah King, who I had gone to school with. She had been fantastic from start to finish, meeting with us several times to finalise all the small details. She made a 4 tier white and teal cake, with two chocolate mud cakes, one sponge and one fruit layer. She also hand made all of the sugar feathers to cascade down the cake, and added two peacock ornaments which we had chosen rather than the traditional bride and groom. Even one of the waiters said it was some of the best wedding cake he had ever seen. Everyone commented on how unique it was, and we couldn't have been happier with it. Flowers: Our flowers were made by Floral Creations in Derby, who did an amazing job. They were a mixture of real, artificial flowers and peacock feathers, and were incredibly unique. 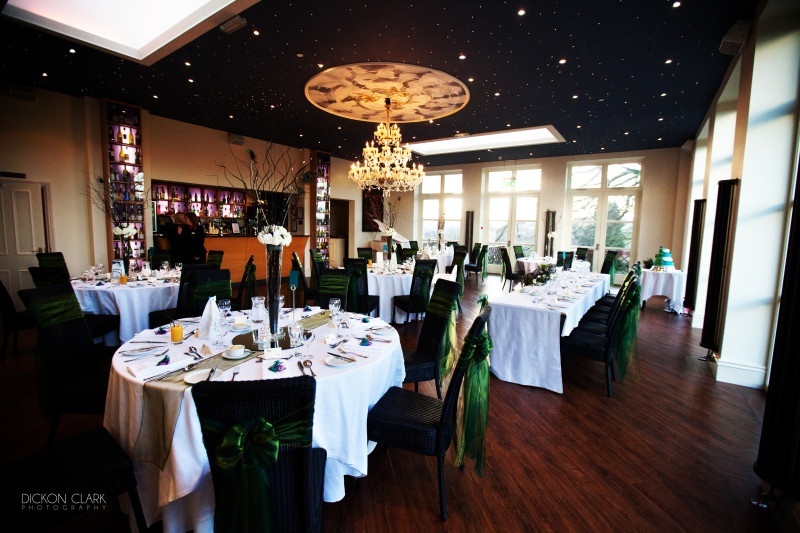 It was important for us to step away from the traditional white roses, and to incorporate the colours of our theme. The florist was fantastic at suggesting flowers to match our theme, and tied in the real, artificial and feathers perfectly. We had green shamrocks, light and dark purple sea lavender, blue thistles and lizzieanthums, with fake teal poppies and feathers. The button holes were a thistle with sea lavender. 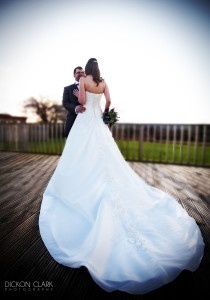 Photographer: We chose Dickon Clark, who we had met at a wedding fair at Belper Football Club. We were instantly drawn to his unique style and creative shots that he showed us. On the day he got some fantastic pictures, with a mixture of posed and natural shots, which is exactly what we wanted. 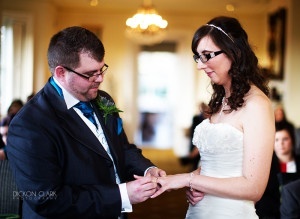 The dress: The dress was from Beau Belles in Borrowash, and was an Alfred Angelo dress. It was the last dress I tried on, and one that I had not actually picked myself- Gail the sales assistant suggested that I tried it on, and I knew that it was the one. It was everything I didn't originally want; strapless, with pearls and a long train, but my opinion soon changed as I had it on. Evening Reception: Our evening reception was fairly quiet, with a few additional friends. The children who we both care for came along with their parents, and we loved having a dance with them. We surprised our guests with a chocolate fountain supplied by The Chocolate Chief which went down really well with kids and adults alike! Honeymoon: We spent a week in Vilamendhoo in the Maldives, which was paradise. We had asked our guests to donate to our honeymoon fund rather than buying us presents, which was really appreciated. On our honeymoon we went snorkelling, swam with manta rays and even had a romantic lobster dinner on the beach. What would be your best advice to pass on to another couple?Just remember it is your day, and no one else's opinions matter. There will be lots of people trying to have their say, but ultimately it comes down to what you both want. On the wedding day, we managed to get half an hour after the wedding breakfast to spend some time alone together which was important to us, as we didn't really get chance to speak to each other after the ceremony. Finally, remember to enjoy it and take it all in – the day goes so fast and you will want to remember every second of it! If Joanne and Aiden's special day has inspired you to have your very own winter Wedding at Shottle Hall please don't hesitate to contact us for our latest special offers and availability.